Aspirin Advertising agency has developed the concept, creativity and design of the corporate printing press office of the Confederation of Builders of Ukraine and called this digest STAGE. The publication is executed in the modern European news media format: stylish, classical, with constructive design and content. Apart of developing of the magazine, the agency also accompanied it during the initial period of development. Standards and templates of the publication were referred to the Confederation for use at the end of six months. The digest STAGE highlights the life of the industry and the participants of the Confederation, contains the industry-specific and market-oriented information. 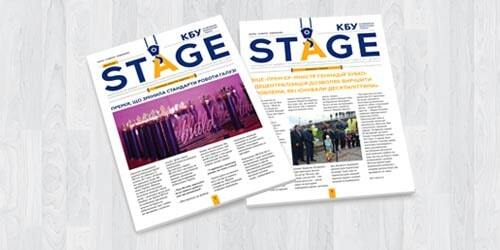 STAGE has a state registration and is distributed among the participants of the Confederation of Builders of Ukraine.